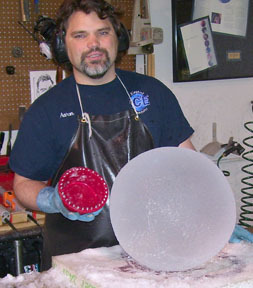 Aaron Costic of IceSculptingTools.com has made some rather large ice lenses from which he has obtained fire. 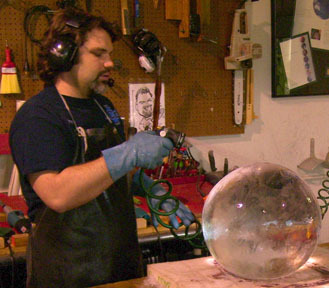 Here are his instructions on how to go about making a large ice sphere. 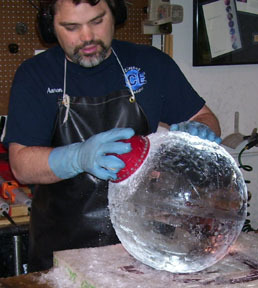 This material is from the IceSculptingTools.com website, used with permission. 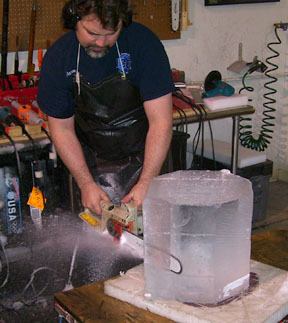 All of the tools and aids shown here are sold by IceSculptingTools.com. The links in this article will take you to various pages on Aaron's website. 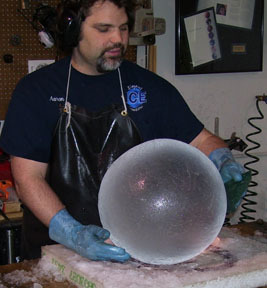 Starting with a perfect cube will allow you to make a nice sphere. photo by Aaron Costic Multiply the width of the cube by .29 (Example- 15 x .29=4.35”) Scribe lines on all sides of the cube 4.35” from the edge. Use a Layout Jig to scribe the lines. 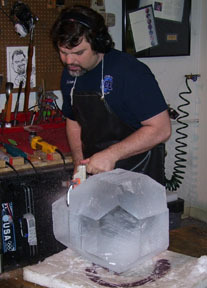 photo by Aaron Costic With a chainsaw cut off the 4 corners (Hexagon from top view). Be careful not to cut inside the lines. photo by Aaron Costic Rotate the Ice & cut off 4 corners, using the lines as guides. Notice the foam under the carving? This protects your saw. 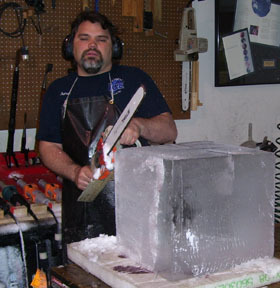 photo by Aaron Costic Rotate the ice & cut off 4 more corners, again use the lines as guides. 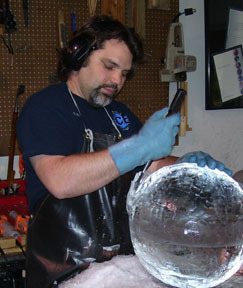 photo by Aaron Costic Using a sharp chisel Carve 3 hoops around ice. 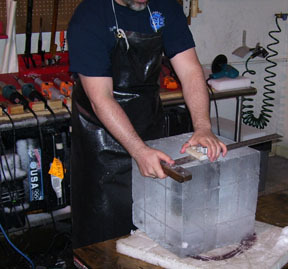 photo by Aaron Costic Using the chisel Remove the 8 humps. photo by Aaron Costic Using a Sphere scratchy board Remove the high spots. photo by Aaron Costic Scratch the whole surface in a circular pattern. photo by Aaron Costic Using sand paper sand the whole surface. photo by Aaron Costic Spray with a hose set on gentle. The Old Japanese “Carve 3 Hoops” technique. 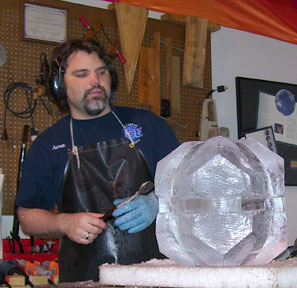 Steve Brice’s “Make an 18 sided shape” technique. Junichi’s “Finish sculpting with the scratchy board” technique. 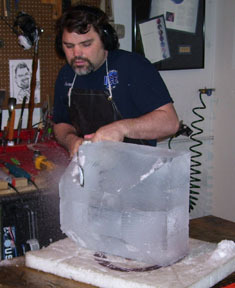 Visit the IceSculptingTools.com website for more info.